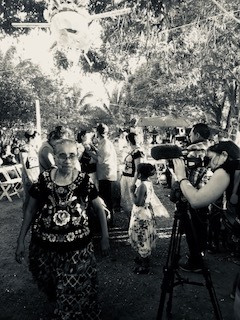 A European cinematographer wonders how free she is in her view and travels for a change of perspective in a city with matriarchal structures in Mexico. She longs for other pictures, a non-hierarchical form of society with an economy of what is necessary and a positive image of women. All this together, she believes to find in one place: Juchitàn, Oaxaca, Mexico. A place of longing that is disappearing. She encounters a variety of people, who accompany her in her daily life and activities to compare her culture, her knowledge and her looks. She has questions about her view of things, whether as a filmmaker figuratively or as a human coming from a particular culture. Especially as a picture designer, she wonders if in a city with matriarchal structures she will find other pictures and other forms of gazes than she already knows – maybe even a kind of “female” gaze? And as a person, she wonders if there are views and values ​​in the place she wants to transfer to her everyday life?